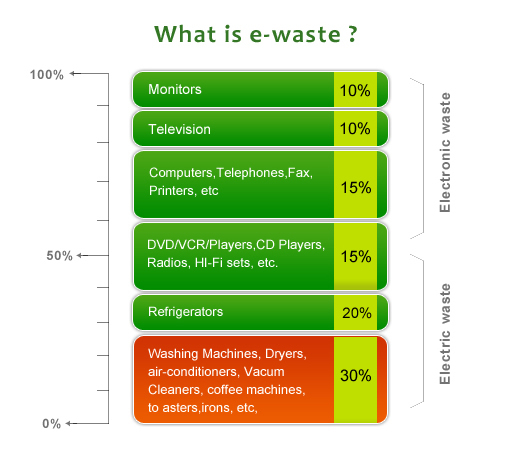 Electronics products ranging from Computers, equipment used in Information and Communication Technology (ICT), Home appliances, audio and video products and all of their peripherals are popularly known as Electronic waste (E-waste). In most cases, e-waste comprises of the relatively expensive and essentially durable products used for data processing, telecommunications or entertainment in private households and Businesses. E-waste is not hazardous if it is stocked in safe storage or recycled by Scientific methods or transported from one place to the other in parts or in totality in the formal sector. The e-waste can,however, be considered hazardous if recycled by primitive methods. E-waste contains several substances such as heavy metals, plastics, glass etc., which can be potentially toxic and hazardous to the environment and human health, if not handled in an environmentally sound manner. E-waste recycling in the nonformal sector by primitive methods can Damage the environment. The ill effects of e-waste could be on soil through leaching of hazardous contents from landfills; in water due to contamination of rivers, wells and other water sources; in air due to emission of gases and burning of e-waste. The recycling process, if not carried out properly, can cause damage to human being through inhalation of gases during recycling, contact of the skin of the workers with hazardous substances and contact during acid treatment used in recovery process. The hazardous and toxic substances found in e-waste include lead (Pb) and cadmium (Cd) in printed circuit boards (PCBs). Lead is primarily found in ll electronic products/ assembly, cathode ray tubes (CRT) etc. Cadmium is found in monitor/ CRTs while there may be mercury in switches and flat screen monitors.Mercury is also found in CFL, relays and some other specific products. Besides the cadmium in computer batteries, cadmium is also used for plating metal enclosures/ metal parts in sub assemblies. Polychlorinated biphenyls are found in capacitors and transformers and as brominated flame retardant on printed circuit boards, plastic casings, cable and polyvinyl chloride (PVC) cable sheathing for insulation and PBD/PBDE in plastic parts of electronics. No exclusive study has so far been made to know the effect of the e-waste in the environment.